We spent about 12 hours on airplanes over the weekend, swapping time zones to travel to and from New Haven to be there for Grandma Jeanne, and to be in community with everyone whose hearts she had taken up residence in. We practiced spelling words for the third grade Bee on the plane. We caught up with family, and cried, and dressed up and sat in a beautiful old chapel with impossibly tall stained glass windows, and let the kids play by the creek in their good shoes, and ate delicious little steak-and-horseradish crostini. We drove back to Rhode Island and slept hard, and fed the ducks, and toured a house for sale around the corner. The woman who owned it had passed away, she was over 100 years old and I thought about the stories that 1960’s wallpaper could tell. Bixby clambered into his old ride-on car with his knees pulled up to his chest and zoomed up and down the quiet street. We talked around the table over plates of homemade chicken Milanese, and over mugs of tea, and outside on what ended up being the first really spring-like day. Mostly though, over the past few days, I’ve listened. See, Grandma Jeanne wasn’t my grandma, at least not by blood. I was content to listen, partly because I love hearing the stories, and partly because it feels awkward to lay claim to a grandmother that isn’t officially “mine”. But Grandma Jeanne has been my surrogate grandmother — something I think my own grandparents would be grateful I’ve had the gift of enjoying all of these years. I remember when Grandma Jeanne and Pop-Pop still lived in the house on Autumn Street: the steep backyard was terraced into a garden, the structure of it lovely even in winter. Inside was all sunlight and warmth. Artwork from their world travels and photographs of family spanned the clean, milk-white walls. Upstairs, presented with pride, were a few gorgeous handmade quilts hung carefully on the walls, their stitches telling stories of their own. I feel lucky to have met my husband’s grandparents while they were still living in that house: lucky to have witnessed a small slice of their life in that love-filled home, where so many poached eggs on toast were served up and the candy dish was always full. But most of all, I feel lucky for the time I got to spend with Jeanne in the years after her husband passed away. My own grandparents were all gone by then, and without fanfare, Jeanne took me into her brood like just one more little duckling. We shared a love of mystery novels — she adored Louise Penny and Martha Grimes — and always talked books when we got together. She took such an interest in my work, always asking to see my latest blog post or a recent article I had written for Houzz. She wanted me to help her design her apartment in the assisted living facility after she moved out of the house on Autumn Street. When I brought photos for her of Bixby, she told me with utter sincerity that she thought I should be a photographer. I think a lot of people hold their own families so tightly that there’s no space for anyone else to get in. But if you’re lucky, sometime you’ll run into another kind of person: the kind that has not just a warm smile, but a warm and open heart that seems built for kindness. Especially where grandchildren — and great-grandchildren and surrogate grandchildren — are concerned. It’s time for Quick Lit, where, joining with Modern Mrs. Darcy, I share short and sweet book reviews of what I’ve been reading lately. This is a juicy list, y’all — it’s not a stretch to say that there is at least one title on this list for nearly every kind of reader. We have a twisty tale set on the river Thames, a strange epidemic, a mormon murder mystery, two immersive historical novels, a gorgeous coffee table book and a pair of must-read political picks for non-political people. This is a delicious novel. “Old fashioned storytelling” is what immediately came to mind when I thought about how to describe it. Set on the river Thames in an indeterminate period in history, there is a mystery involving an old pub, three missing girls, and one child who appears to be dead and then lives again. A wee bit spooky and utterly transporting — perfect for cozying up with on a cold night. I fully admit that the cover blurb by Emily St. John Mandel (author of Station Eleven) sold me on this book. In it, a mysterious sleeping sickness starts in a Southern California college dorm, and spreads to epidemic proportions. The storyline kept me frantically turning the pages, and I found myself thinking about it well after I put the book down, which is always a good sign. This book was recommended on the Indie Next list, otherwise I probably wouldn’t have picked it up — but I’m glad I did! A Linda Wallheim mystery set in mormon Utah, this felt like a comfort read (if cozy mysteries are a comfort read for you) but also illuminated Mormon culture in a way that, as an outsider, I would never have access to otherwise. If you’re at all curious about what it’s like to be a Mormon woman in the modern world, read this book. The protagonist is married to a bishop and is a feminist, which leads to some really thoughtful examinations of the intersection of beliefs, family life, gender roles and power structures. This year I am embarking on an intentional quest to winnow down my unread shelf a bit. If you’d like some guidance to do the same, I recommend checking out Whitney Conrad on Instagram and her interview with Anne Bogel on the What Should I Read Next podcast. The January Unread Shelf Challenge was to read any unread book on your shelf. 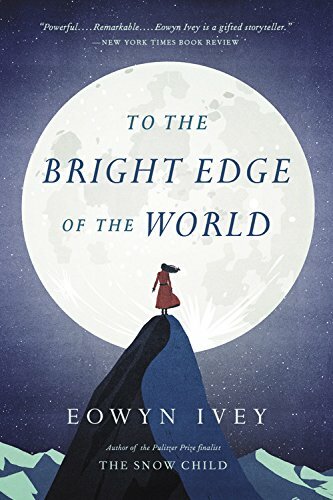 I chose a title by Eowyn Ivey, author of The Snow Child. Like The Snow Child, this story is set in the wilds of Alaska, with a few strange and magical twists. Ivey follows a Colonel Allen Forrester, a Civil War hero, on an exploratory mission to map the interior of the Alaska Territory by way of the Wolverine River. Told in alternating perspectives, we see the Colonel’s adventures as well as his wife back at camp, who is learning about the photographic art. The rich descriptions of nature swept me away, and I loved learning about this slice of history I knew very little about. For February, the Unread Shelf Challenge was to read a book that was gifted to you. I chose Manhattan Beach…which was gifted to me by my mother in-law and has been on my TBR pile ever since! This is historical fiction with a twisty little mystery, family drama, beautiful writing, and diving. It was fascinating to learn about the (scary!) early days of diving through our protagonist Anna, who works at the Brooklyn Naval Yard as a diver during World War II. I’ll definitely be adding Egan’s other works to my TBR! I was lucky enough to receive an advance copy of this coffee table-worthy book from the publisher. It is gorgeous and just one of those books that makes you feel all warm and cozy and cared for. Buycks is a Christian, and you should know that this book is centered around a Christian perspective. That said, I see a lot to appreciate here, whatever your faith tradition. The core purpose of the book is to help the reader create a home that nourishes on all levels, from your senses to your soul, a message I believe anyone can get behind. Five million stars. Can I just leave it at that? Hah. This was my first Goodwin, and I can see now why people love this author so much. 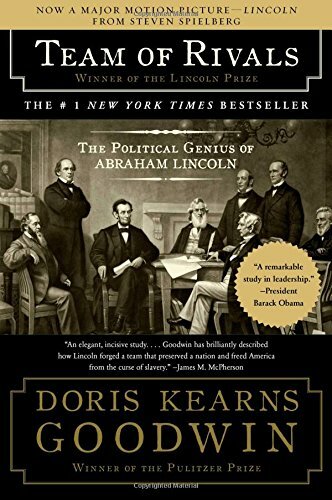 I wouldn’t have guessed that reading a presidential biography could be so compelling! Deep-diving into the life of Abraham Lincoln was a hopeful, inspiring experience worth savoring — and certainly worth the page count (which is not small). Necessary reading for every human being in 2019. I’m a huge fan of Sarah and Beth’s podcast, Pantsuit Politics, where they gather each week to talk politics from different sides of the aisle with “No shouting. No insults. Plenty of nuance.” But you don’t have to be a fan of the show to appreciate the book. It’s filled with the duo’s trademark insight, depth of understanding and empathy, while at the same time challenging each of us to do better — to make the effort to have tough conversations about politics with people who don’t agree with us, without falling back on the comfort of our own well-defined party lines. Craving Whitespace in Your Home + Schedule? Cultivating Simple is a different kind of clutter clearing course — one that engages your head and heart as you clear your space, so you can make room for what matters. Registration is open now and the first session is FREE! The tail end of winter is the worst. I may be free from the iced-over car and rock-hard, dirty snow piles now that we’re back in California, but that doesn’t mean I’ve forgotten what it’s like. And no matter where you are, this time of year (with its still-short days and iffy weather) doesn’t always make it easy to maintain a positive attitude. Or get out of a warm bed. I’ve been compiling a mental list of all of the things, big and small, that feel like good self-care, especially at this time of year. On a cold, stormy night with no babysitting in sight we decided to make the most of things and go on a “family date”. We grabbed a game (Exploding Kittens is big in our house right now) and headed to our favorite pub. It’s a family-friendly place stocked with their own board games, a small menu and grown-up drinks for those who choose to partake. We came away feeling like we got our night out, plus a family game night. I’m pretty low-maintenance when it comes to skin care and beauty: I prefer a quick, simple routine with minimal products. That said, in winter it feels really good to splurge on a little treat (or two or three) and take those extra few minutes in the shower to feel like a real person with soft, lovely skin. In case you’re curious, here are a few products I’ve tried and loved: this vitamin C serum (a few drops will do you); Melissa day cream; and this brightening facial scrub. Anticipating a trip can actually boost your happiness. You get to browse photos of gorgeous places and daydream all sorts of fun possibilities. You don’t even have to plan a Big Trip to make this work. This year we made a commitment to do more super-quick weekend getaways just for fun. You might be surprised at how many interesting little trips you can come up with not far from home. I’m not sure why, but for a long time I was resistant to trying the KonMari method of folding (aka “filing”) clothes into neat little packets. You guys, I don’t know why I waited so long! Once you get the hang of it, it really doesn’t take any more time than folding the usual way (aka messily) and being able to actually see everything in your drawer at a glance is a total game-changer. But what I really wasn’t expecting is how the process of folding the KonMari way makes me feel all Zen. Curious? Watch Marie Kondo fold clothes above (the folding starts at about 1:50) and then give it a try. For the past nearly-four years, we have been living in an apartment. It’s a lovely apartment, steps from my mom and brother, a few blocks from one of my oldest friends, walking distance from Trader Joe’s, a delightful cafe, a running path by the beach and a great school we love. My husband takes the ferry to work, 20 minutes later he’s in San Francisco; on the boat ride home he can have a beer and look out at the sun setting over the bay. But it’s in a city where we can’t hope to buy a house, not anytime in the foreseeable future. It’s an apartment without a yard where my outdoors-loving kid and I crave open, wild spaces. It’s in a city where the air is regularly “unhealthy for sensitive groups” which makes me nervous since I had asthma all through childhood. These past almost-four years have, in a strange way, felt like limbo. Enjoyable, for all of the reasons above, but with an undercurrent of transience. How long will we be here? Where will we land next? I hate the feeling of not knowing, even though we are the people doing the deciding. I wouldn’t want someone to tell me where to live, and yet in a small way it feels like that would be easier. I crave limitations. When the world is too wide-open, it’s scary not knowing where you’re headed. With a course charted, I can relax into the journey. I’ve been slowly piecing together a patchwork of not-heres to help determine where that great big “you are here” arrow might land next. First, after reading This is Where You Belong by Melody Warnick, I decided to cross off any place too far to drive to a good friend or relative’s house within an hour or two. For us, that narrows the options down to just a handful of circles on the map. Unfortunately, some of those circles are still thousands of miles apart, begging the question: how else can we decide where to go? I know what I want: A walkable town, good coffee, independent bookstores, clean air, beautiful nature, quality schools and public resources like parks, playgrounds, walking paths and libraries. A nice big yard where we can have a dog and a treehouse. My work is portable, but my husband will need to stay near at least a mid-size city. We took a quick overnight getaway to one potential locale over the weekend, and I was instantly disappointed. It was near areas I’m quite familiar with, and I thought I had a better sense of things. But after arriving, I quickly realized that seeing a place with eyes to living there is a different proposition altogether. I didn’t like the treacherous curving roads with no sidewalks — I imagined my son trying to navigate them on his bike, and felt my heart jump into my throat. The densely oak-y hills felt strangely oppressive. Pulling into the parking lot of the junior high school, we were greeted with a roof that needs replacing and a cluster of mostly temporary buildings surrounded by chain link. I came away feeling dispirited and down. But as the experience percolated in my head a bit more over the next 24 hours, I realized that this — the ugly school, the tummy-twisting roads, the oppressive trees, all of it — was a gift. It’s a gift to be able to say, that’s not for me. It’s a gift to be able to name what’s not working. It’s a gift to be able to walk away: to cross something off your list and say, nope, not going to happen. Where has that left us? Honestly, I don’t know. There are still communities near the one we checked out that have potential, and then there are the other (much farther away) circles on our map to weigh. But being able to cross this one place off our list of potential places is like taking a bag or two of castoffs to Goodwill — it’s not the whole shebang, but it’s a beginning. A bit of space is opening up, and that’s worth celebrating. Hello my lovelies! Some of you may remember that last month I started a gratitude practice. We’ve all heard about the far-reaching benefits of gratitude (it’s been found to boost happiness, strengthen relationships and more) but keeping a gratitude journal can seem like just one more thing to do. Since accountability can help cement a new habit, sharing my list is a good way to boost the chances that I will continue making gratitude a regular practice in my life. Why don’t you join me? I had an idea that recording my list on twitter would be a quick and easy way for me to keep up with what had been a spotty-at-best practice, but after testing it out for about a month I’ve decided it’s not for me. Instead, I’ve been keeping a running list in my bullet journal, and I’ll share a segment here each month. Little pink baby cheeks and toes on a wee niece. Finding independent bookstores wherever I travel. It feels like home. Sand and sea as far as the eye can see. Big wedges of watermelon on the deck, juice dripping down arms. Being with so many favorite people, all under one roof. Heirloom tomatoes from my mother in-law’s garden, carefully packed and driven all the way down the eastern seaboard. 5pm on the deck of our rented beach house, icy G&T in hand. Finding a Little Free Library specifically for children’s books! Waking up at first light, dawn on the beach, just me and the dolphins. Sunrise over the ocean, all quiet where the wild horses roam. Fresh heirloom apples, first of the season from our favorite farm. Honey bee crossing! Homemade sign declaring the presence of a thriving hive. Saturday morning, fresh coffee, stack of cookbooks. Listing favorite recipes to make this fall. Escaping town for the cool blue of the reservoir, lush green trees, lizard spotting with my son. Finishing a book that feels so satisfying you can’t imagine picking up another one. Camping with old friends. No cell service. Lots of stars. Next steps: Look for themes to boost your joy. Looking back at this list, I’m noticing nature, fresh seasonal foods, and books. (No surprise there, hah!) If you make your own list, reflecting on any themes that crop up can be illuminating: if there are certain things, people, or experiences that tend to light you up and bring you joy, why not make room for more of the same? Intentionally choosing to do small things that make us happy (and increase feelings of gratitude) is a wonderful way to gradually move your life into alignment with your truest callings.